Pippins and Acorns class have been busy reading many (pink!) Peppa Pig stories this week and have both collaged beautiful Peppa displays. 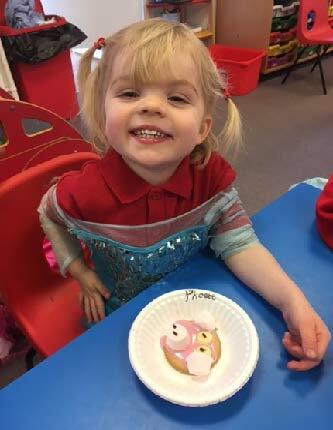 We enjoyed using our wellie boots to make lots of bright coloured footprints using paint and iced biscuits with pink icing and then used marshmallows and chocolate buttons to give them noses and eyes. We also jumped in as much mud as we could find in the woods! Oaks class have been finishing off their winter topic by making snowmen using fingers and colouring their scarves and hats. They also iced biscuits and used a marshmallow to make melting snowmen biscuits. We also had lots of fun painting our feet to make snowmen. The children made apple bird feeders in the woods and are looking forward to starting their superhero topic next week.